Our fall vacation plans started early this year, I believe it was February when my wife suggested that we go on a cruise. We had been on several cruises and I was ready to do something different but had limited options. Last year we planned on going to Germany but Rose’s place of employment went up for sale and her future employment in question so we put off our Germany plans until this year and went on a Disney cruise instead. This year was not as questionable. Rose got a job with the new company and all was well except taking off two consecutive weeks while working for a new company is probably not the best idea. Instead she decided another cruise was our best option. We wanted to go near our anniversary in October so I did some searching and could find no reasonable alternative in our price range. 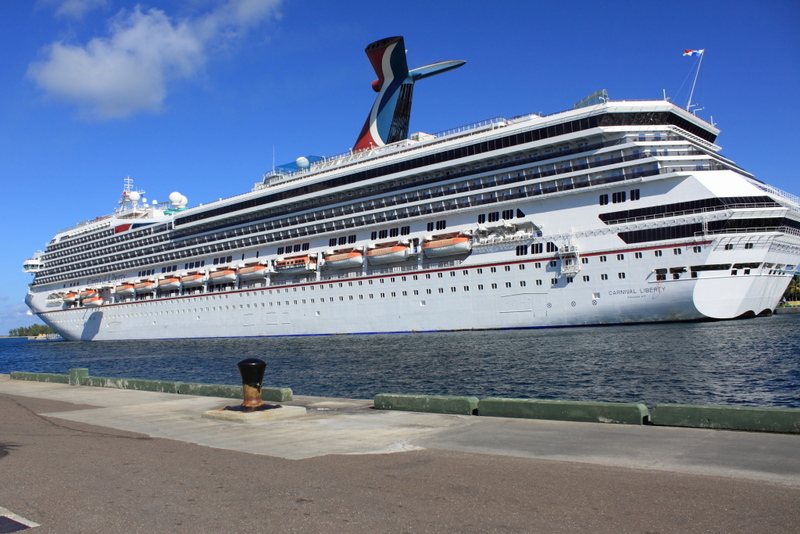 After many hours of searching we both decided that a Cruise on the Carnival Liberty, which sailed from Port Canaveral in Florida to Nassau, Bahamas and then to St. Thomas and St. Maarten in the Eastern Caribbean. We liked that because, even though we are not big fans of Nassau, the Virgin Islands and Eastern Caribbean is a place we have never been and we wanted to see somewhere new. What I didn’t like was that it was a Carnival cruise. 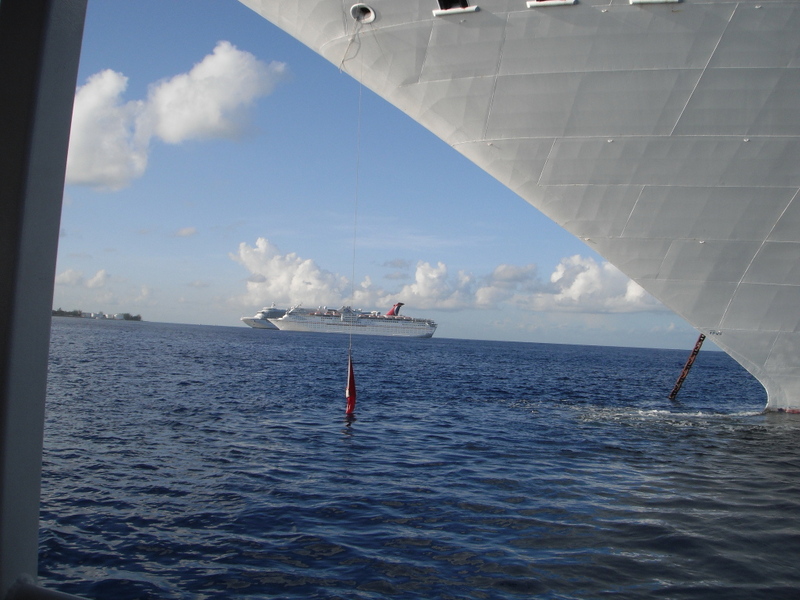 The last time we cruised on Carnival we had several issues that tarnished an otherwise fun time. I wrote Carnival about the problems and even included pictures as proof but was disappointed by their eventual response. I was hoping that they would at least offer us a discount on a future cruise to compensate us for the problems but instead I got what seemed like a form letter that just said “too bad for you” in a nice way (see here). We decided that the shorter cruises used older ships that were more in need of maintenance and a longer seven-day cruise would probably be better, so we booked it. Once we booked it, it was my job to find a rental car. Our truck is a pig on gas so, to save a little money on fuel and avoid the wear and tear on our vehicle, renting seemed like a good option. The last time we rented a car for a cruise was with Enterprise. At that time I wanted to drop off the car and pick up another car for the return trip but the drop off fee was so unbelievably high that it was cheaper to rent it for a week and pay the high parking fee as well. This time I found a good deal with Budget. I also accidentally discovered a trick for saving money. By scheduling my pickup time for 9:45 a.m. my cost was just over half of what it would have been if I wanted to pick it up at 8:30 a.m. So for just over $100 we booked a car for our trip over and our trip back and didn’t have a drop off fee. It seemed like it took us a week to pack because we had to bring everything but the kitchen sink. I want to go on vacation to relax but a cruise requires you to dress up every evening for dinner and there was two formal nights which meant I had to bring a suit and tie, not exactly vacation attire. Worse, all that extra clothes meant we had to bring a boat-load of luggage… literally. Picking up the rental car went anything but smoothly because the rental office was moving and they had no internet access. Since it was the first day of our vacation that minor hiccup did not bother us. We had booked a hotel on Cocoa Beach and left on a Friday, the day before the cruise departed, because we didn’t want the stress of driving across the state with no time for problems, should they occur. It was also a chance to visit Rose’s dad who lives thirty minutes from there. That evening we received an automated call from Carnival saying the Liberty was delayed due to having to make an unscheduled stop due to a crew member’s illness. The message said not to arrive at the terminal before 1:30 p.m. That left us in a difficult predicament because we had to return the car by 9:45 and take the shuttle to the terminal. The morning of the cruise we had breakfast at the hotel, picked up a few last-minute supplies, then headed to Budget to return the car. We decided to ignore Carnival’s recommendation and got on the first shuttle to Port Canaveral. Once there everything went very smoothly and we were on the ship before noon, well before Carnival told us to show up. Once aboard I noticed the windows were quite dirty, just like they were on our last cruise on the Carnival Destiny, but the rest of the ship seemed to be in good shape. We had a room on the spa deck, #11-06 on the port side, third room from the front. It was the highest room level on the ship and our section only had a few rooms. Rose thought it was a good choice because it would be quiet and it would be easy for us to workout because the fitness center was connected to the spa. She was right about it being quiet. The ship left port on time and shortly after we were out to sea we headed down for dinner. Getting there was complicated, at least until we learned the trick. 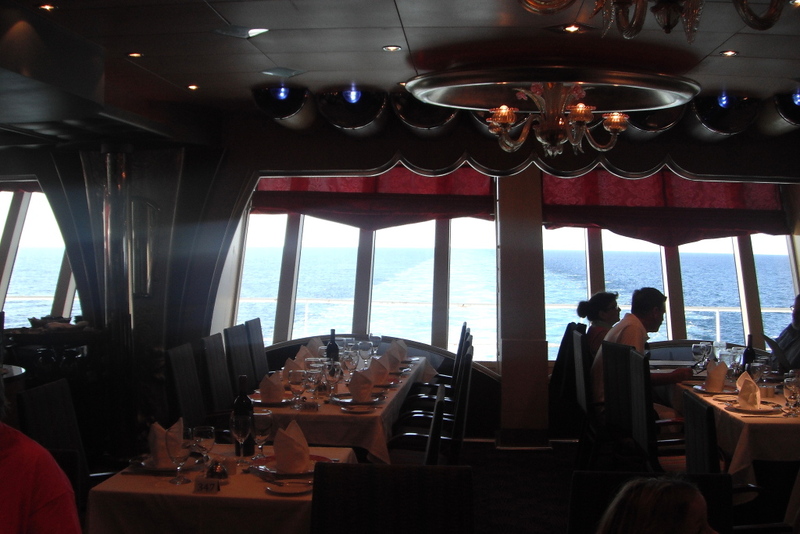 We were on deck eleven forward and our dining room, The Silver Olympian , was on deck three aft. Our deck did not go all the way across the ship and deck three was blocked by The Golden Olympian Restaurant and the galley. So to get to dinner we went down to deck five, walked past the shops, casino and bars, and then went down to deck three. After we checked in, we were brought to a small booth where two elderly women were sitting. Rose hates sitting at booths but there wasn’t much we could do without making a scene so she just accepted the situation and we sat down. It wasn’t that bad. The women were sisters and were quite nice and we were relatively close to the large aft window that eventually framed a beautiful sunset. The food was also pretty good. The menu changes everyday but has some items that stay the same. I was told years ago the food on cruise ships is world-class. I have not found that to be true but I am not that picky and have always been happy with the quality. It is the quantity that I am not used to. The portions are always smaller than you would find at your local restaurant, which is probably not a bad thing since I usually overeat and feel miserable when I go to restaurants. After dinner we went to the casino. I am not a big fan of gambling because I have a medical condition called “bad luck,” but Rose likes to play the video slot machines so I will play video poker while I wait for her. I play the video poker because I have found it to be the slowest way to lose money. I have tried the slot machines but find them no more enjoyable, or profitable, then throwing quarters into the ocean. There was no show the first night so we went back to our room. The room steward came to our room during dinner, turned down the bed, left us chocolates, the next day’s schedule and, of course, a towel animal. 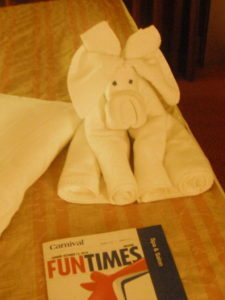 We expect all that but we never know what towel animal he will make so it is always a surprise. We got to Nassau early and had the breakfast buffet on the Lido deck. I try to eat healthy so I just loaded my plate with several different fruits, a small amount of eggs and a little cottage cheese that I mixed with peaches. That was my breakfast almost everyday. We were off the ship at around 8:30 that morning. We have been to Nassau several times and it is our least favorite port. The Straw Market is a popular place for people to shop but it is filled with hundreds of high pressure vendors all trying to sell you the same crap. In fact, the entire area around the port is like that. We chose not to do a ship excursion. We just got off to see what looked interesting. The walkway is like a gauntlet, loaded with people trying to push you to spend money with them. We chose to go on a horse and buggy ride for $40. 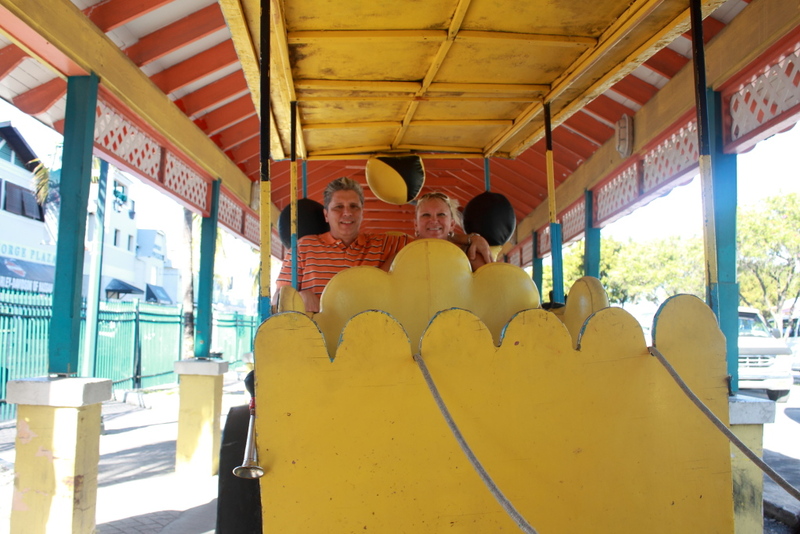 After we got on the buggy a woman took my camera and snapped a picture of us and then asked for a tip. The ride around town was somewhat interesting but shorter than expected, about twenty minutes. We paid $49 with the tips, which was not worth it, but few things are when you are on vacation. After the ride we did a little shopping in town. Rose had some gifts to buy and I was looking for coffee mugs with covers because bringing two coffee cups half-way across the ship every morning was not easy to do. I could only find one store that had them but they were $10 each for cheap plastic mugs. I guess the word “Bahama’s” somehow made them valuable. We went back to the ship before 10:00 a.m. where I was able to get two nice, stainless-steel mugs, with a specialty coffee, for $8 each. I think it would have been better to stay on the ship that morning. Early that afternoon the captain announced that because of Hurricane Gonzalo, we would not be going to our scheduled ports but would instead divert to Grand Cayman and Cozumel, Mexico. We were not happy about that since we booked a more expensive cruise to avoid going to the same places but there was not much we could do about the weather. Rose didn’t like eating at a small booth so she got our table changed for dinner that Sunday evening and for the rest of the cruise. We were led upstairs to the second floor and sat almost directly over were we sat the night before. This time it was a large circular table with nine other people. I felt a little bad about abandoning the sisters but I’m glad we did because every person on that table was very likable. We went to the theater that night and saw a show that involved a lot of singing and dancing. It wasn’t really my thing but Rose likes stuff like that so I put up with it. It was the only show we saw that trip except for Friday night, which I will get to later. We spent the next two days relaxing. We wanted to go to the pool but it seemed all the pool chairs were always taken. I think many people go up before breakfast, put a towel or other belongings on a few chairs, then go back to their rooms or to breakfast. There are rules against that but they are not enforced so the only people allowed to enjoy the pool are the rule breakers or the lucky few who get there at the right time. We did find some out-of-the-way chairs on Monday and spent a little time in the small adult pool but that was the only time during the entire cruse that we did that. 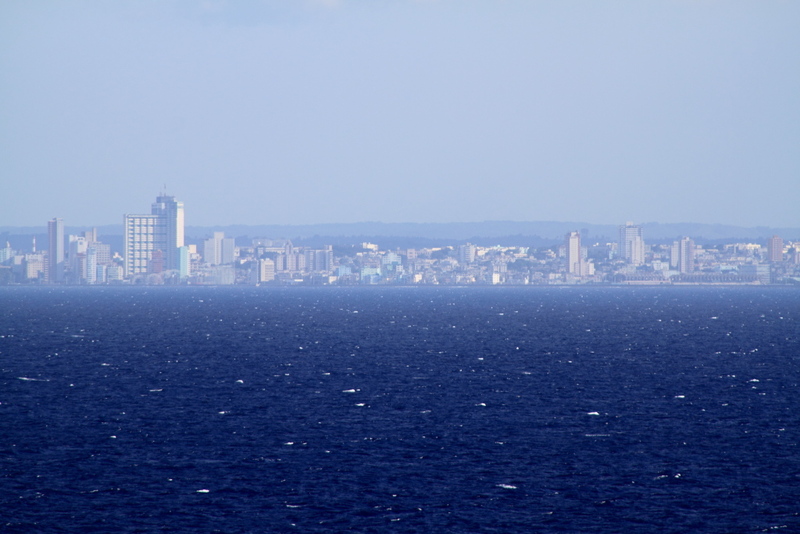 We also spent a little time on our balcony, at least I did, and I was able to get a pretty close look at what I think was Havana, Cuba. Other than that, our balcony went unused for most of the trip. This might be Havana. If anyone can confirm or deny that, please leave a comment. That night, and the next, we watched karaoke after dinner because two of our table mates were singing. Those two also got picked for the talent show that Friday night. I’ve never been to karaoke before and I always imagined a bunch of very bad singers but most were very good and some were great. We arrived at Grand Cayman on Wednesday morning, which was our fifteenth wedding anniversary. Since a coral reef surrounds the area, ships are not allowed to pass a certain point, so there were several tender boats on hand to ferry passengers to shore. We had breakfast first and then got on one of the boats and headed to shore. 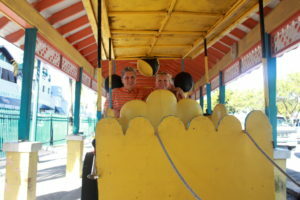 The last time we were in Grand Cayman we went on a Marineland Tours amphibious bus, which we really enjoyed. It took us for a tour around the island and then went into the water where we got a chance to do some snorkeling. 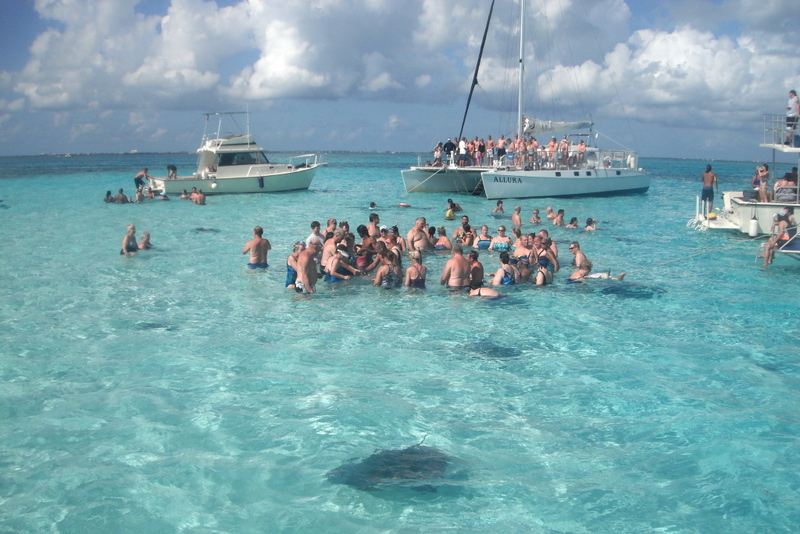 This time the tour wasn’t available, probably because we were not scheduled to be there, so we picked an excursion that went to a sandbar referred to as Stingray City and then to the Cayman Turtle Farm. We got on a bus which took us to a boat for a thirty minute ride to the sand bar. As we approached, we saw several other boats along with many people in the water. We then all got a mask and snorkel and got into the water. The water was between three and four feet deep and crystal clear. 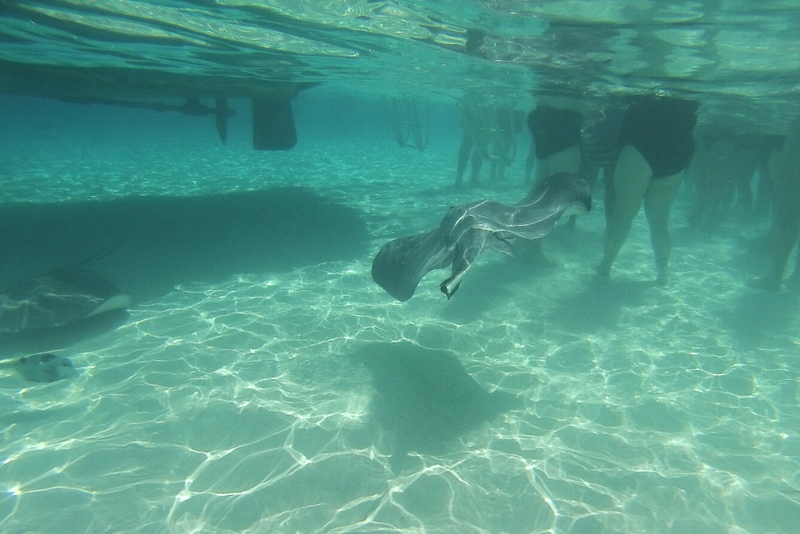 At first I saw nothing but soon there were stingrays swimming all around us. These stingrays were larger than the ones I have seen on the beaches near my home in Florida. Rose and I did a bit of snorkeling even though the water was clear enough to see the stingrays while above water. It just seemed more enjoyable to be swimming with them. 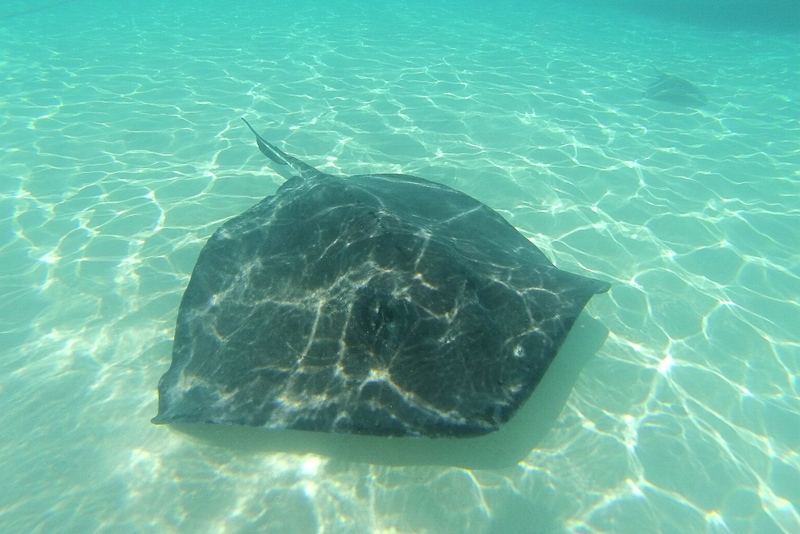 I had my GoPro camera with me and took videos while I swam with the stingrays. After a short time the first-mate “caught” a large stingray and was bringing it to people to hold and kiss. Supposedly, kissing a stingray is good luck. Rose was able to kiss the stingray and the mate took our picture while she held it. 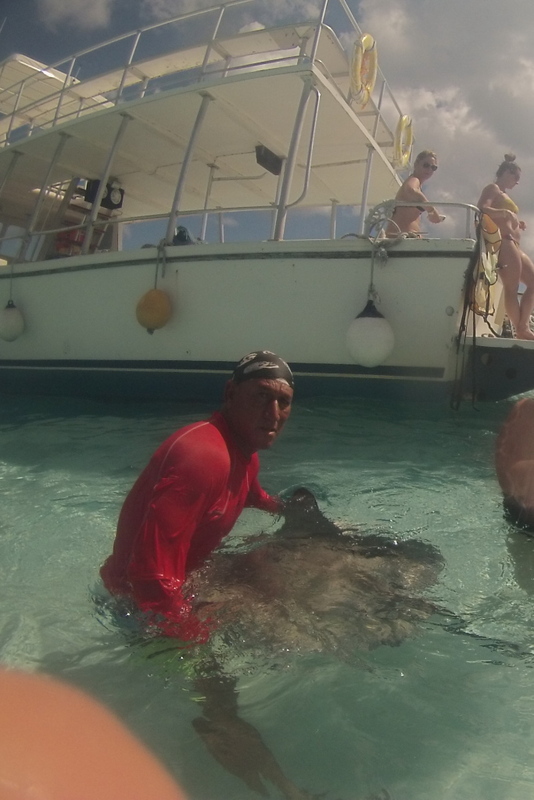 Later, he brought out some food which really attracted the stingrays to our group. A few large ones were swimming through the crowd causing screams from several young women. They must have been used to people because they had no problem squeezing through the dense group of humans. When it was over, we hated to leave, but we had turtles to see. Once back on shore, our bus took us to the Cayman Turtle Farm. 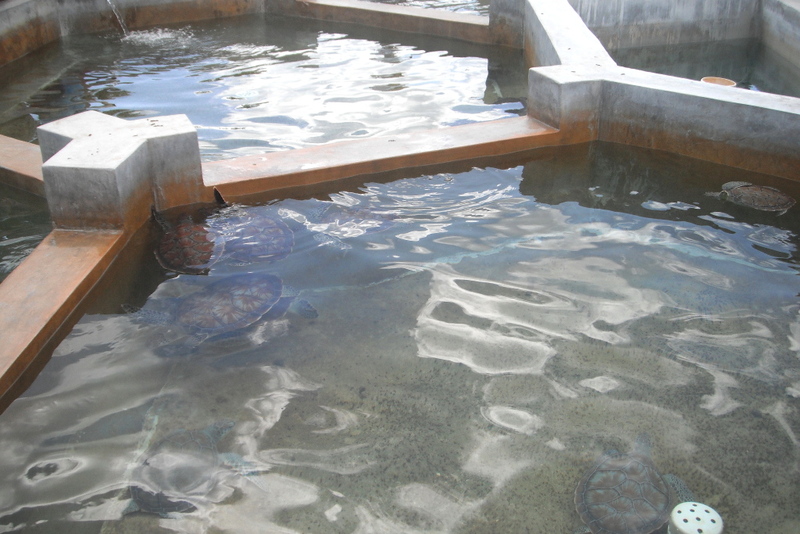 The farm breeds sea turtles and has a large, artificial “lagoon” that allows visitors to swim with the turtles. We were given the option of going on the full tour or skipping it and the entire group elected to skip it. Instead we went to where several tanks housed adolescent turtles of various ages. We were hungry at this time so we decided to buy lunch at the café. We sat outside where a rooster, hen and two or three chicks wandered around the tables looking for scraps. The table overlooked the lagoon where several people were snorkeling. When we finished eating, we headed to the lagoon and picked up snorkeling gear for ourselves. As we waded into the water I could tell this wasn’t going to be as pleasant as I had hoped. The ground seemed slippery and there was what looked like chucks of algae floating in the water. I put my mask on and reluctantly started snorkeling. It seemed like I was swimming through a green snowstorm. I just assured myself that there was a shower waiting for me on the other end. At first I saw nothing but then a swimming turtle came into view. I swam toward it and saw him eat a couple of pieces of the algae so I assumed it belonged there. On the bottom were two more turtles resting on top of a large grate. Our time was short so after a short swim we headed back. We immediately took showers and then headed into the gift store where we didn’t find anything worth buying but did so anyway. Rose bought a couple of Christmas ornaments and I got a shirt without looking at the price first. The next morning we were in Cozumel. I went to the Lido deck to get coffee and saw that someone was up all night making towel animals and putting them on chairs all around the pool. I thought that was a nice little surprise for people. We were given a ride ten minutes up the road to Hotel Cozumel. There we were led into a large room and everyone was given a margarita as we entered. This was a drinker’s paradise because the margaritas kept coming. We started out by making our own margarita to go with the one we already had. The two young women who were hosting the event kept us entertained as we learned how to make several different kinds of salsa as well as guacamole. When the food making was over, the tables and chairs were removed and it was suddenly a dance studio. The plan was to teach us how to salsa dance. It was a fun experience but I only saw one couple who really seemed to pick up on it. We decided they must had done this before. We spent our last day aboard the Liberty just relaxing. We cashed in what was left on our player cards at the casino and were pleased to have lost no more than $60 for the entire trip, which was great because we each spent about thirty minutes a day gambling. That means it cost us less than ten dollars per hour to gamble. That evening we had our final dinner with our new friends and then most of us went to see Carnival’s amateur show which I believe was called “Legends.” Two of our new friends were performing in the show. One was Madonna and the other Ricky Martin. I enjoyed their performances when I saw them at karaoke but both stepped it up a notch for the show. The other performers did a great job too and we really enjoyed our last night on the ship. We arrived at Port Canaveral early Saturday morning, and since we brought too much crap to carry off ourselves, we had plenty of time to relax and enjoy breakfast. This trip was the first time in over ten years that we did not carry our luggage off the ship. When our vacations are over, we like to hurry up and get home, so it was discouraging to see people walking off the ship at least an hour before us. When we finally did get off the ship, we stood at the luggage carousel for a very long time. It started to seem like our luggage was the last two pieces to leave the ship. We then had to wait around for budget to pick us up and bring us to their car rental location. Once there, things went pretty smoothly and we were on our way home. It would be hard to rate this cruise fairly because it did not go to the ports that we chose. If I assume that the ports we went to were part of the plan, I would say that I was pretty satisfied with the experience. My biggest problem would not be with the ship or crew but with the fact that we could have taken a similar cruise out of Tampa (near our home) and saved a ton of money. We did have a good time, and that is the important thing. We very much enjoyed going to Stingray City and we met so many nice people on this cruise. Perhaps next time we will make it to the Virgin Islands. If I were to do something different, I would pack less. Rose convinced me I needed to dress up every night for dinner so I had to bring several dress pants and shirts. In addition, I had to bring a suit for the formal nights. That was half my luggage in dress clothes and it wasn’t necessary. Formal night exists just so the cruise lines can sell you pictures and you are not punished for dressing like you are on vacation. In addition, many people went to dinner wearing a decent pair of shorts and a Polo shirt or something similar. All our extra luggage meant that we had to let Carnival remove it from the ship and ended up with a broken suitcase because of it. I also would get a room with a window but skip the balcony unless the prices are very close. We spent very little time on the balcony during our cruise. Smokers might think a balcony is worth the extra money but smoking is no longer permitted anywhere except certain designated areas of the ship. Let me know what you think Please leave a comment if you have any thoughts or tips for other travelers. Note: I have videos that I have not had time to process but will try to add them to this post within the next few weeks, so check back again. This entry was posted in nature, outdoors, Reviews, Travel and tagged Bahamas, Carnival, carribean, Cozumel, cruise, Grand Cayman, hurricane, Liberty, Nassau, Port Canaveral, review, Virgin Islands on November 5, 2014 by Chuck Huss.